Independent bottler Douglas Laing is adding to its range of Remarkable Regional Malts with a Campbeltown blended malt called The Gauldrons. 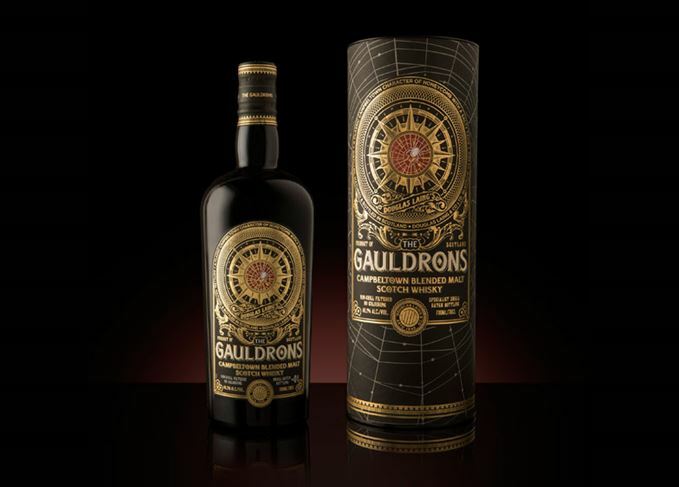 The Gauldrons joins the company’s regionally focused range, which features blended malts from six of Scotland’s main whisky-producing regions – Speyside, the Highlands, Islay, the Lowlands, the Islands and now Campbeltown. The Gauldrons takes its name from the dark sandy coves lining Campbeltown’s west coast, which translates to ‘bay of storms’. The expression and its packaging are inspired by the legend of Scots king Robert the Bruce, who, hiding from his enemies in a cave, watched a spider’s efforts to spin its web and was encouraged to return to battle against the English. Fred Laing, managing director of Douglas Laing, said: ‘The Gauldrons has seen us carefully marry together some of our best, and indeed rarest, casks of Campbeltown single malt. The Gauldrons is bottled without chill filtration or added colour at 46.2% abv, and will be released in small numbered batches for around £50 a bottle. Other blended malt whiskies in Douglas Laing’s Remarkable Regional Malts range include Timorous Beastie from the Highlands, Scallywag from Speyside, Big Peat from Islay, The Epicurean from the Lowlands and Rock Oyster from the Islands.